• all prices in Canadian dollars. • prices do not include shipping or insurance. • to order: PM here on CGN, email at precisionoptics@hotmail.com, call our store at 250-747-4637, or call/text 250-991-1406 - please ask for Omer. • please note that prices are subject to change without notice. Many Z3, Z6, Z8i and X5's also in stock, at unbeatable prices! Last edited by plainSight Solutions; 04-22-2017 at 07:47 PM. These prices are still good! Is it only n the listed items? Searching for a new spotter. 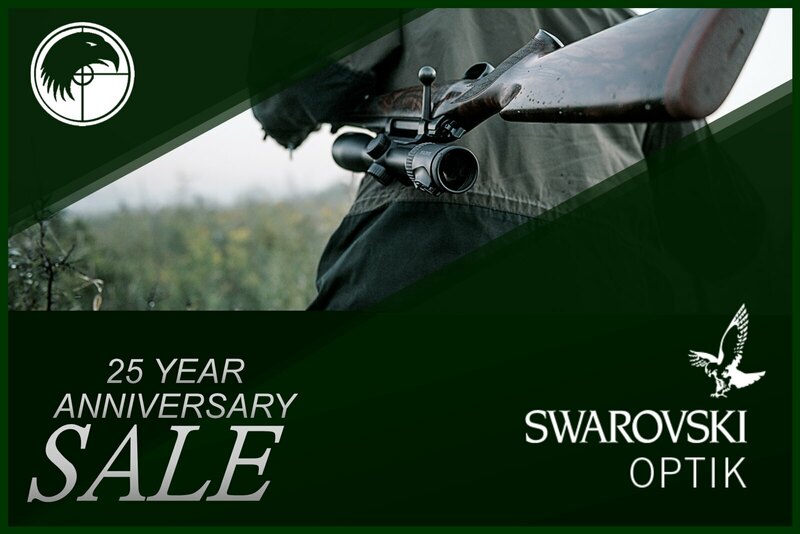 I am in the process of gearing-up from scratch for hunting and shooting (yes, I am a newbie); and for the past few months have been researching / comparing prices on Swarovski glass online / exchanging emails with shops in Canada across provinces. 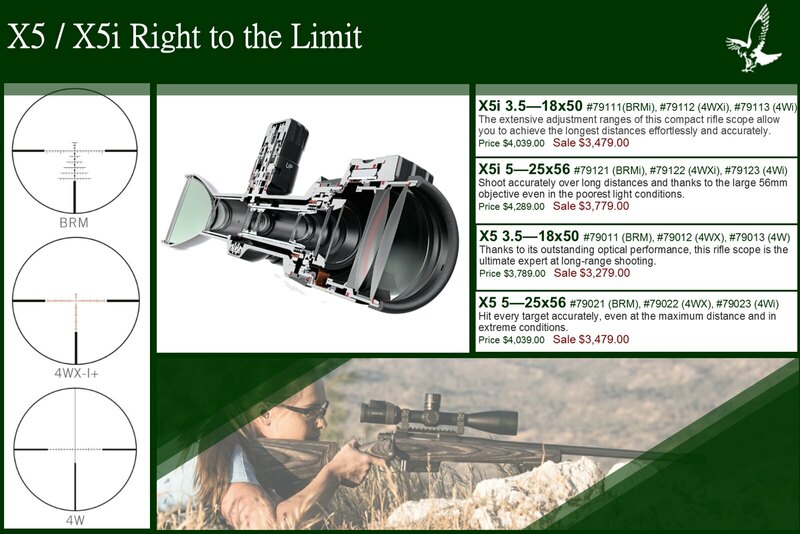 I placed the order yesterday on the following items (not listed in the original post above) based on a great deal offered by Precision Optics. And I mean a great deal. Omer is great to deal with and super fast via emails / telephone. He assured me fast shipping (under 10 days, inspite of the fact that the scope has to be ordered from Swarovski directly) to Toronto. Supposedly, Swarovski is super fast (under a week) with new orders as well. This is an incrredible offer and a great year to grab top quality glass; and I believe based on my research that this is the shop to buy it from. I will keep you posted on the shop's follow-through. 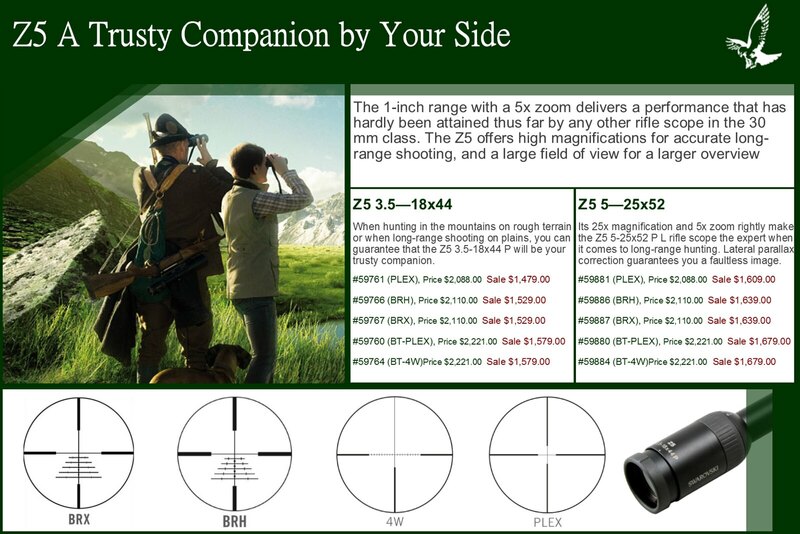 I'm looking at the Z5 and trying to decide between the two available models (3.5-18x44 and 5-25x52). Is there a noticeable low light difference between the two? I'm assuming the 52mm window is going to be better in this condition but by how much. One of the main reasons I'm considering the 3.5-18x44mm is the larger MOA adjustment. With the info I have found the 44mm will have about 13.25MOA with a custom BT and the 5-25x52mm will only have around 9.5MOA with a custom BT. Is this correct? 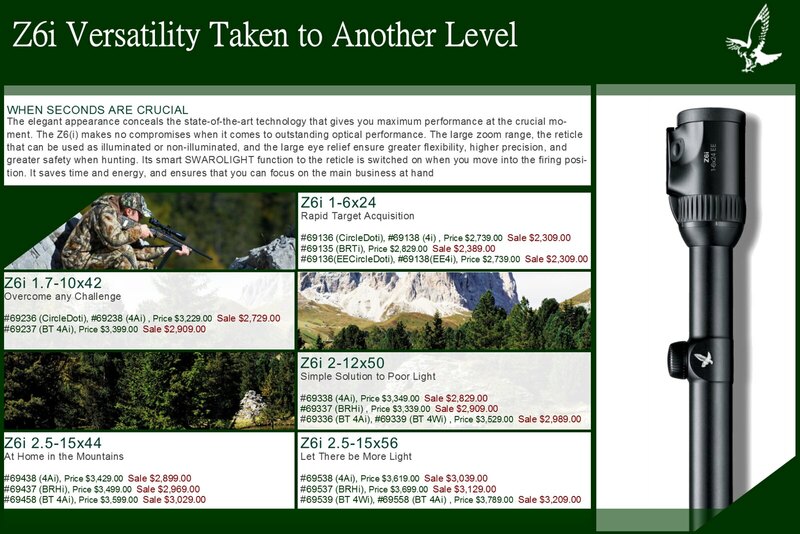 The Z5 3.5-18x44 and Z5 5-25x52 BT models both have 13.25 MoA with the zero-stop in place (53 @ 1/4 moa clicks). This is true whether you use the included turret, or a PBC/custom turret. However it is interesting to note that the Z5 3.5-18x44 has 70.5 MoA of available elevation, while the Z5 5-25x52 has 40.75 MoA. So what I think your saying is they both have 13.25 MOA in one full turn. The 3.5-18X44 has the ability to do more revolutions then the 5-25x52. Correct? Do you know if a two turn custom turret is available for these scopes? The Z5's actually have 15.5 MoA per revolution, however the manner in which the zero-stop works limits the rotation to 13.25 MoA. 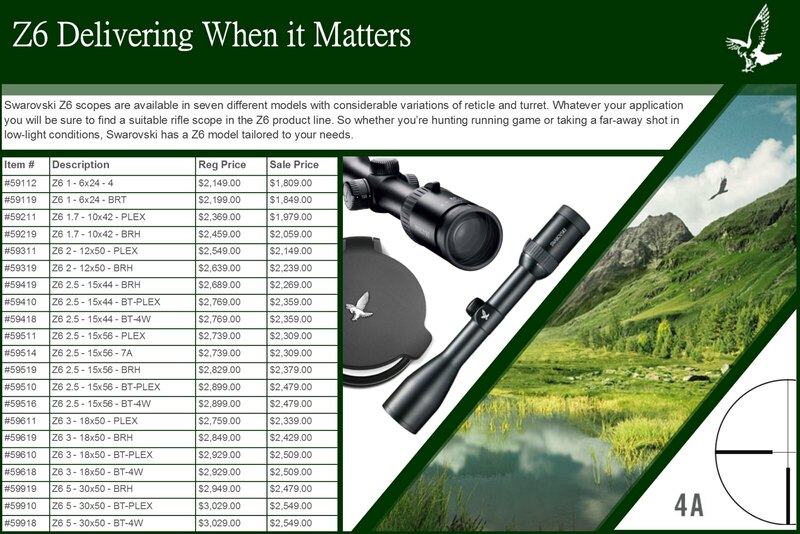 Yes the Z5 3.5-18 has more internal adjustment than the Z5 5-25. Swarovski currently only produces double revolution custom ballistic turrets for the X5 scopes.